The upmarket holiday town of Plettenberg Bay, about 380 miles (600km) from Cape Town and 125 miles (200km) from Port Elizabeth, was originally called Bahia Formosa (Beautiful Bay) by the early Portuguese explorers, and it is still possible to see why, despite explosive development of luxury homes, hotels and a thriving town centre. The town - familiarly known as 'Plett' - is a favourite holiday destination for South Africans and foreigners alike with its unspoilt golden beaches, year-round Mediterranean climate, dramatic rocky Robberg Peninsula, and vibrant nightlife. The bay is a nursery for the endangered Southern Right Whales, which arrive each winter and spring to calve. Plettenberg Bay's shopping malls and a variety of shops provide everything that is needed by travellers, including clothing and speciality goods at several boutiques where souvenir-hunters can also find arts, crafts and antiques. 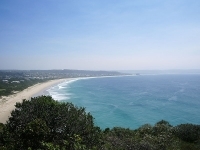 Plett is by no means a shopper's paradise, but the town is well-equipped for self-caterers and holidaymakers. There are plenty of dining opportunities in Plettenberg Bay, from beach pubs, bistros and deli's to five star cuisine and award-winning à la carte menus. Foodies will find Thai, Italian, fresh seafood, steak and a variety of other choices on offer. Although Plett is a small town, the nightlife is fairly lively, yet laidback. Choices are somewhat limited. In summer most action takes place on or near the beach, beginning with sundowners in typical South African style at one of the lovely beach bars, but there are a few fun pubs and clubs for later evening entertainment with pool tables, live music and dancing. Travellers should note that Plett is one of a handful of South African coastal towns that draw massive crowds of school graduates at the end of the academic year (late November and early December), meaning that during this time the town is crowded and the nightlife is extremely frisky. The surroundings of Plettenberg Bay provide a playground for sports enthusiasts and the list of activities is almost endless. Between July and December the bay is home to Southern Right Whales that come to calve in the protected waters. The lagoon and the bay itself are perfect for all sorts of water sports and activities including boat cruises and sailing, paddling, fishing, swimming, and scuba diving, while the beaches allow for long solitary walks and surfing. The mountains and forests offer a variety of trails for hikers, mountain bikers and horse riders on holiday. Plett's golf courses are also highly regarded and provide plenty of challenges. There are numerous polo grounds in and around Plettenberg Bay; the best known is at Kurland, where major polo tournaments take place over Christmas and Easter. Robberg Nature and Marine Reserve is only two and a half miles (4km) outside Plettenberg Bay, and offers the chance to view wildlife including penguins, Cape Fur Seals, Southern Right Whales, and the occasional Great White Shark. Plettenberg Bay is best avoided over the Christmas holiday period when prices are double, accommodation is impossible to find and everything gets very crowded.